An Early Home Birth Baby-- Birth Story! Welcome to another birth story Wednesday! I love how birth takes so many different forms, shapes, times and places. You can read this mama's blog here! I can say that the birth, besides being very surprising (four weeks early), was an incredibly intense yet empowering experience. I think I was dilating the whole day before and didn't know it, and had lost my mucus plug, but again didn't think anything of the discharge (it wasn't bloody or smell bad so no fuss right?). Around 4pm exactly two weeks ago I was watching a movie in the bedroom and I felt Oliver slide down in a strange way. A little pee came out (indeed it was urine not water breaking) and I couldn't stop - we called the midwife. She said take a warm bath and drink some Cranberry juice. By the time Ron was back from the store getting juice, I was having bad period like cramps. We were totally scared, called the midwife again. The cramps were getting worse and worse and I couldn't escape them, all I wanted was a little break to get an emotional grip on this whole thing - I looked at Ron at one point and said, "I'm in labor". I needed to admit it. We were in the living room, I was on hand and knees - moaning through contractions. Our midwife came in and indeed me being half naked and really into contractions - she was certain I was in labor. She said to us that "we're having a baby today! and all was well because I was a few days away from 36 weeks". I felt so relieved at that point, just to have someone else say it was okay, we were okay to birth at home. My mom showed up shortly after, I had moved back into the bathroom on the floor (it was nice and warm) still on hands and knees. My first thought was "I need to get to the bedroom, I can't have this baby on the bathroom floor". We went into the bedroom - there I rode out a few more contractions with Ron and our midwife doing counter pressure. At that point our second midwife arrived and my sister (and baby Cora). The contractions were intense and I had wished the birth ball was inflated (we only had half a birth kit together and I was waiting to blow up the ball until early Jan). I think I was in transition at this point - I can't recall getting to the bedroom and my thoughts were only, "I can't do this - it's too hard". Suddenly, I felt the need to push - it wasn't a physical feeling exactly, I can only describe that emotionally my body was telling me to push. The midwife checked me (for the first time and oh my god! it hurt, hurt, hurt) I can't imagine having to be checked frequently throughout. I had a small lip left - she suggested I could push around it while she held it back - too painful. I rode out a few more contractions instead. Over the next hour or so - I pushed in various positions, lunging, hands and knees, on the birthing stool (shaped like a big toilet seat), leaning against Ron. Pushing seemed to take forever, I found solace in watching my progress in a mirror (directing the mirror position while pushing - I was very aware of what was going on around me). My sister, mother, and Ron were doing a great job of telling me that I was doing well. I kept asking if this was all going smoothly - and that it was okay it was taking long. The midwives only said - your baby is the perfect size for you and it is taking as long as you need and that yes, it is all normal. Ollie's heart beat was great, despite being on the perineum for so long. Pushing was by far the hardest thing I have ever done. It took all of my strength both physically and emotionally to get him out. The thing about pushing is, for the most part, you have control over how hard and long you push. I would only give on big push and then need a rest, finally the midwives said that they were thinking about a small cut - I screamed "no!" and shortly after I pushed little Oliver out. I think it was just the motivation I needed to give full quality pushes - I didn't want to be cut - emotionally it would have been too hard for me to deal with. But the exact motivation I needed to push his head out. The body seemed to slide right out. Oliver was here - at 9:58 pm 6lbs 6oz. It took about 6 hours of active labor and two pushing. Not too bad. And today, after two weeks of nursing a lethargic pre term baby, who is still developing his suckling ability, and one full day of dropper feeding and breast pumping (day 3 I believe). We've established a nice nursing routine and he is almost back up to his birth weight. It was been a wild, intense, and emotional experience, but I wouldn't have expected anything less from my son. (I have received some feedback from midwives and other birth professionals stating that a birth this early is not safely done at home and has risks associated with it. I am not advocating delivering at home prior to being full term. I do not personally know what is considered legal in different states or what is medically safe. As mothers we have a responsibility to carefully choose our care provider, pediatrician, birth place, and educate ourselves also. We also have a responsibility to learn what is safe, legal, and what our midwife is comfortable with. And this is a good story, how? A baby only 35 weeks+ (the other way of saying "a few days from 36 weeks") being born at home, who *obviously* had prematurity issues mostly likely should have not been born there. I only hope the family took the baby to a pediatrician immediately after the birth, but somehow, I doubt that. This, most assuredly, is not a birth to be held up as a positive example of a homebirth midwife or a family's decision in that homebirth. Irresponsible midwife, irresponsible parents. 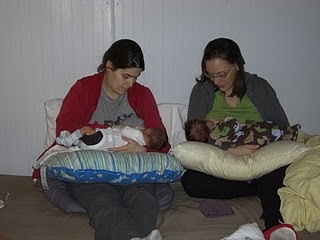 I am a very big homebirth advocate, AS WELL AS a homebirth mom, who delivered a 10 lbs 42 week baby at home. But delivering a preterm baby at home is just foolish, and yes, despite being over 6 lbs, that baby was PRETERM. A lethargic baby for 2 weeks? You don't see the problem there? I'm with NGM, I bet baby wasnt taken to a Pediatrician or even a Naturopath in a timely manner. I try to share a variety of stories based on how positive they were for the mother. To this mom, it was a positive birth experience. I applaud this mother for trusting her body and her baby to decide when the it was the "right" time to come into this world just as you did with your "overdue" baby. Every birth is as different as the people involved. Mother Nature knows what she's doing. Wow, I am hurt. Right now, our son is a happy and healthy one year old. He began nursing well shortly after that post, and I have to say that our midwives were hyper vigilant the entire time we were giving birth and afterward. And yes, our baby was seen by our physician at home the next day, who saw absolutely NO concern and didn't feel that intervention was necessary. And secondly, our midwife is a naturopath and homeopath, I trusted her knowledge, instinct and expertise. Tammeh, please in an effort to keep this a peaceful and positive way to have open discussions about birth, it is better to keep patronizing tones to a minimum, and making assumptions about our decisions, and commenting on my blog with harsh and hurtful words is not productive. It is uprising to me, especially NavelgazingMiwdife, who I respect and have followed your blog frequently, for condemning me and my story so quickly with out knowing anything about me, besides this short blog post. Thank you Mongolia girl, for pointing out the contradictions. Mama Birth, thanks for having this space to share my positive story. wow. how hurtful some of these comments are. this is a beautiful story, Jessica. how courageous you and your partner were. and also how courageous you are to share publically. how strong. how loving. how caring. thank you for sharing your story and for showing yet another way that beautiful and strong babies are brought into this world outside the norm of over hospitalization. i am sorry that people judge and point fingers without knowing you, your baby, your family, your complete situation, or your providers. just more proof that these stories need to be out there!!! I find it really sad that there are women judging this mother so harshly. I think that so much of what we, as women, learn over the years is that we don't know anything about our bodies and that we are too emotional to make rational decisions. To me, a large part of the home birth movement is regaining that trust in our bodies and in our ability to think clearly, even (if not especially) in the middle of a stressful event. The comments by NavelgazingMidwife and Tammeh are so disempowering. If you want to have a discussion, engage in that and not a roast. The conversation strain on Facebook is just shameful. We have to support each other as women, as mothers. It is evident, through this birth story, that the mother in question trusted herself, trusted her midwife and trusted the process. Her son is big and beautiful and healthy. Thank you to the ladies who stood up in defense of this mother. Thank you Jessicca for sharing your story with us. I am very sorry that you were personally attacked. I am very happy that it was a good experience for you and your baby. I honestly didn't think anything of it before I posted it and got some of that feedback. As a mother I have friends who birth at different times. One births between 42 and 44 weeks with all her babies. I have another friend who births between 36 and 38 weeks. Both have healthy happy babies of varying sizes. A hospital birth for a mama at this point would have almost certainly resulted in a baby wisked to NICU for hours on end and seperated from mama. I am grateful for home birth midwives and for midwives who also choose to serve women who otherwise could not get home birth care. Good for you, mama! You know your baby better than anyone else and would have taken him in if needed. I am in support of this birth story. I am doing research for my own means, and am very glad to see this posted here to help people like me who are seeking examples of exactly this. I respect you for sharing, as there will always be people whose fears and opinions differ from yours and with such a personal subject it can be hard for others to appreciate the sometimes great differences in opinion/belief another might have. I am certain many women who have a preterm birth out of hospital are unlikely to share their experience if it was their choice, as they know they would face judgement no matter their reasoning. So glad to find this story! I am 35 weeks and have had two premature infants previously, 34 & 33 weeks, and an high risk of it happening again with this one. I am terrified of delivering at home, on my own, but am faced with the possibility as my husband is going out of town this week, leaving me alone with my three children ages 4,3 and 1 in a new area we just moved to and no family or friends near by. So glad this was a positive experience for mama and baby. Thank you for sharing!! !